This project has been a long time in the making! Honestly, I'm slightly nervous about sharing this side of my life but I think it's important to 'keep it real'. So often social media makes our lives look all too glossy and picture perfect as we can edit, photoshop, omit and basically share only what we want people to see and not what is real. For example, to take these photos I didn't have a lovely studio with perfect lighting, I literally stood out on our back lawn with my project on a white board using my DSLR camera. However I couldn't get the white balance I was after as the sun kept hiding behind the clouds, insects kept landing on my project, the wind blew it away three times so I had to stick it down and finally the cat came and sat right in the middle of the page. In the end I used my phone to take the photos after removing cat hair from an alpha sticker and photoshopping out a bug splat near my head. So, the honest truth... I suffer from depression and my life is full of ups and downs, great days, good days, some bad days and a few very dark days. The good out-way the bad by a very big margin but every now and again I fall into a dark place and with love, support, medication and an incredibly understand husband and children I managed to get back up fairly soon after. 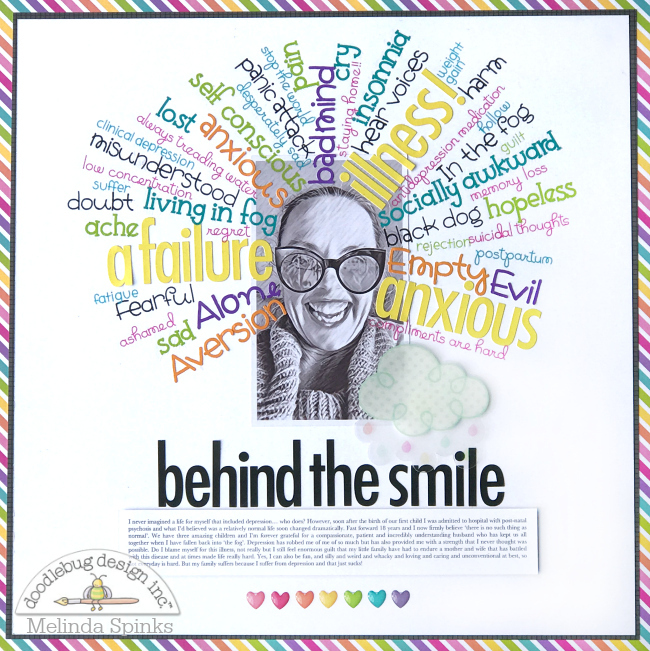 So to make this layout I sat myself down with a glass of wine and chocolate, a whole pile of Doodlebug alpha stickers and rub-ons and I wrote a list of as many emotions I could remember that would express some of the feelings I have had over the past eighteen years. I struggled with choosing a photo of myself to use... at first I thought a serious photo would be more appropriate but then it just seemed to be 'too sad' and not convey how I feel today. So I chose this goofy pic of myself which I edited with a hand drawn effect filter on my phone to give it a cartoon effect. I honestly don't take myself too seriously most of the time so this photo was the best representation of how I am 'mostly'. What lurks behind isn't there all the time and not every emotion, thought or fear hits me all at once. Some of these things I have only felt once or twice in the past 18 years but they all make up what depression has meant for me. I wasn't exactly sure about what embellishments to use as the layout was rather busy with all the alphas and I didn't want to detract from the message so after numerous tries with various pieces I settled on this simple acetate cloud with raindrops from the 'Spring Things - Odds & Ends'. I also added a row of 'Rainbow Hearts - Shaped Sprinkles' across the bottom of the layout to draw the eye down the page. 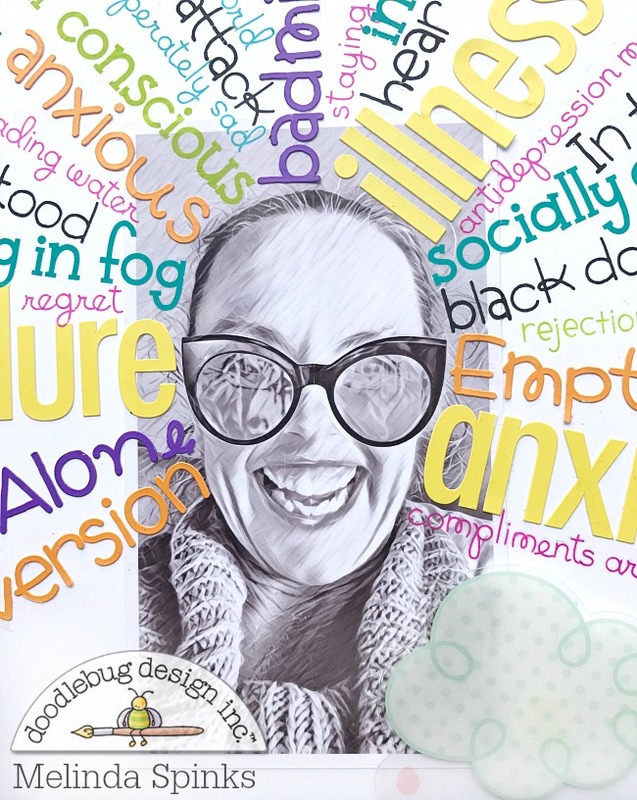 Thank you for stopping by today and don't forget to come back tomorrow for the start of a new week of 'all about me' inspiration from the Doodlebug team. Oh my goodness Melinda... I adore this layout. I love that you shared the beautiful, raw truth. I can associate with quite a few of these feelings too. So sorry you have to deal with it from time to time. Sending big hugs! 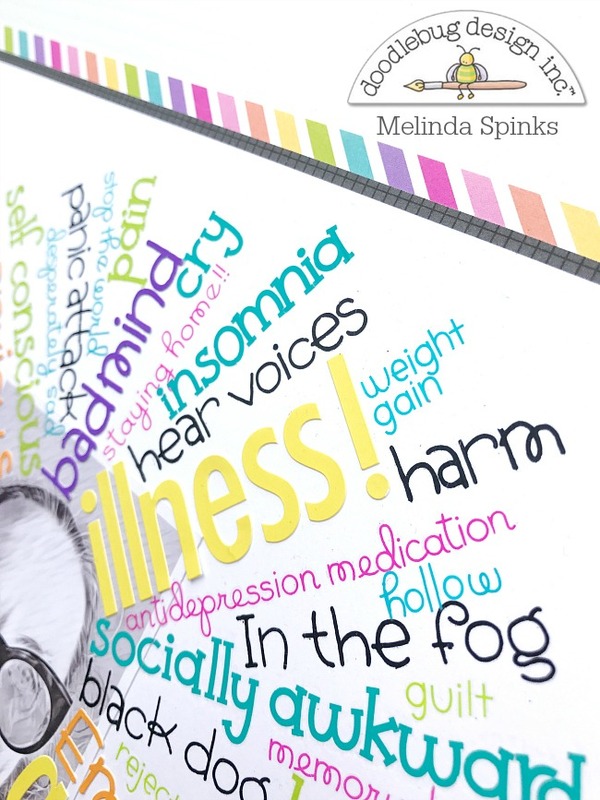 Melinda this design perfectly reflects your message. Such a powerful layout! I know many people who suffer depression behind a smile. Big hugs to you! Thank you Kathy for your kind words. 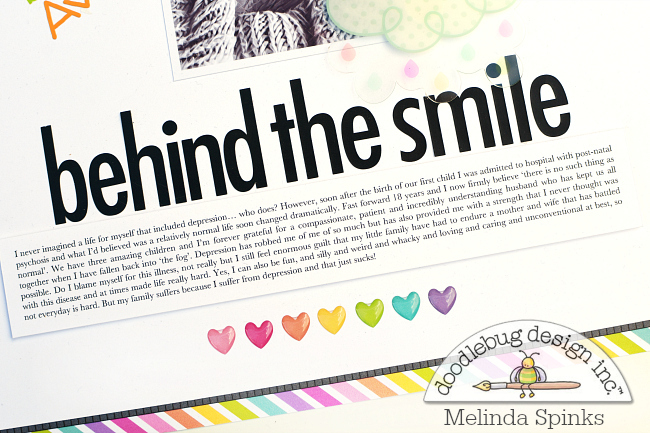 Fantastic Melinda, awesome project and blog post!! This may be one of the best layouts. 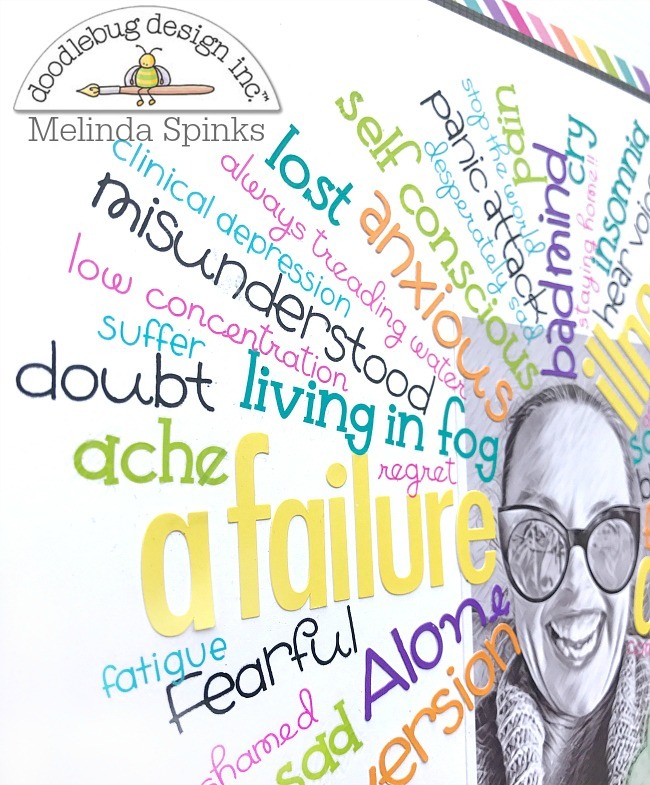 Melinda, you are right that you are stronger because of what you had to go through. I am so sorry you have had to go through it but this is so amazing that you were so raw and real about it and so brave to share it!!! Thank you for doing it!!!! Way to go, crafty hero! Courtney, you are the sweetest, truly! Thank you so much. You always make me smile. Thank you for sharing this and the reminder that we don't suffer alone. I'm so proud of you for sharing this side of yourself! Beautiful work, Melinda!!! You are so strong and brave to share. Proud of you for being vulnerable and real.